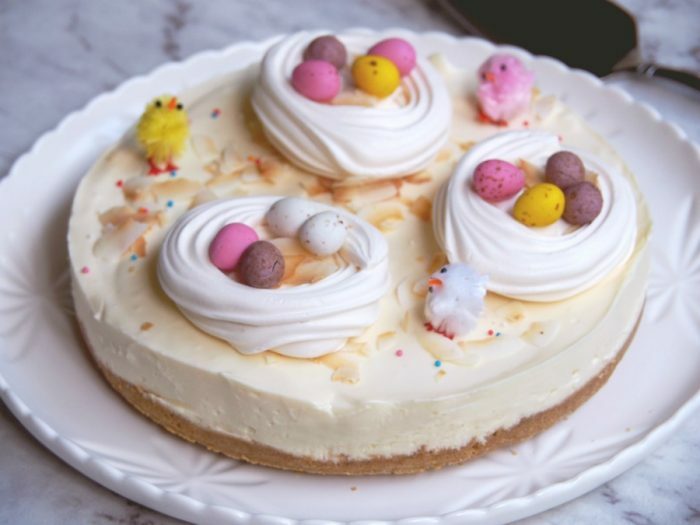 This No Bake Easter Cheesecake is egg-stra special! One of my favourite things about blogging is the friends I have made in my computer. I count Leonie as one of those friends, even though we’ve never met yet. We share a love of food, Disney and even share the same birthday! In fact, we’re sure we were twins separated at birth, albeit two or three decades apart. Let’s not split hairs, shall we? Over the years, Leonie has generously shared not just the gift of her friendship, but priceless treasures too, like her granny’s cookbook that was passed down to her mum (published in 1906) and “The Common Sense Cookery Book” (published in 1946) among other tantalising tomes. 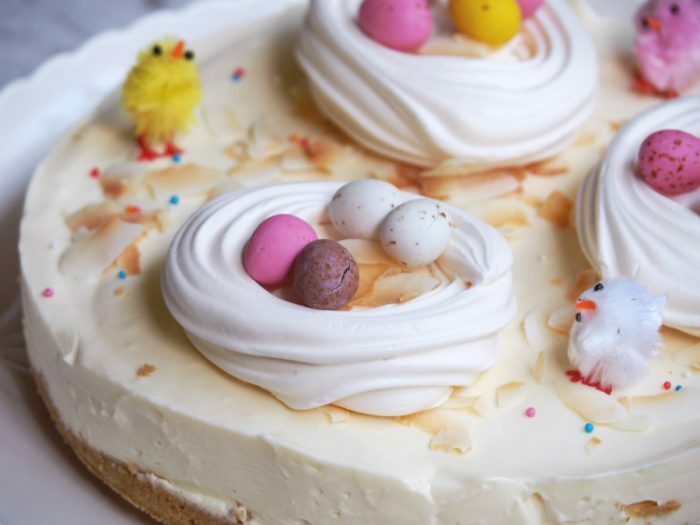 She’s also shared some of her delicious recipes, in fact, it was Leonie who gave me a virtual pav tutorial so that I could make my first (but not my last) perfect Pavlova. 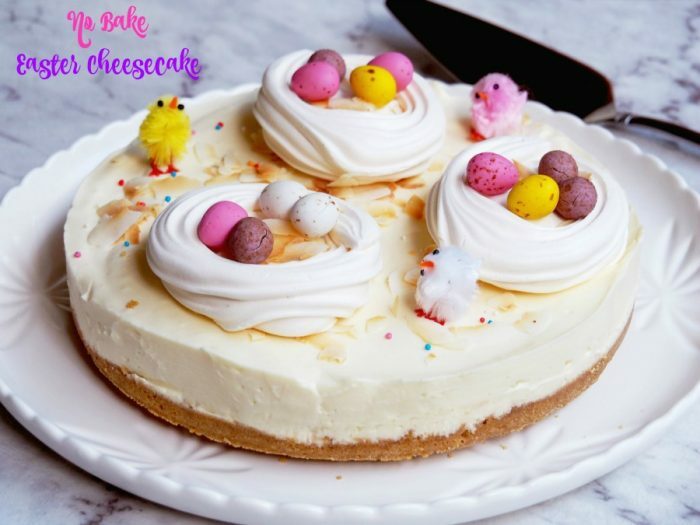 This cheesecake is another one of her delicious recipes and it’s probably the easiest and most delicious cheesecake in the world. 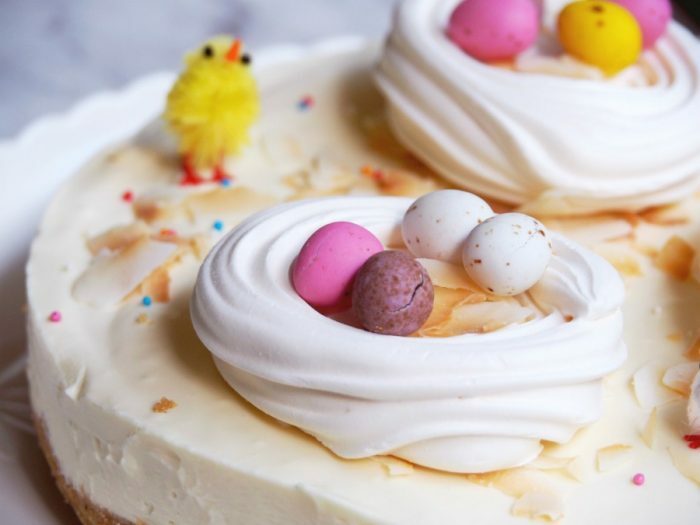 I’ve pimped it up for Easter, but this cheesecake is not just for Easter, it’s good all year round, served with some whipped cream and maybe a side of fruit coulis. It’s deliciously creamy and really rather rich, so a little goes a long way. The lemon juice sets the cheesecake just so, but if it’s especially hot or you’re especially pushed for time, add a little more lemon juice (up to half a cup) to be sure that the cheesecake is set just right. Make sure the condensed milk is chilled because that will make for better whipping! 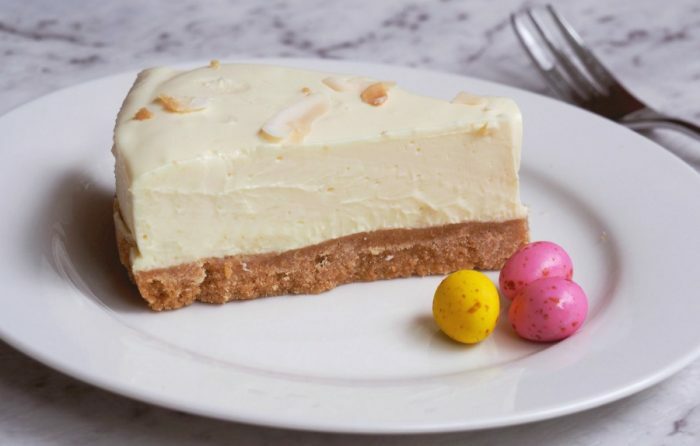 This recipe is a real keeper and I think we’re going to be seeing (and eating) a lot more of this cheesecake. In fact, I’m going to follow Leonie’s advice and always keep a can of condensed milk in the fridge… Just in case! Have you got friends in your computer too? Have you got a favourite no bake dessert? Lightly grease a 20cm springform tin and line the base with baking paper. Crush the biscuits using a food processor and add to the butter mixture. Press the biscuit mixture into the cake tin and pop into the fridge to chill while you make the filling. Mix together all the cheesecake filling ingredients until smooth. Pour cream cheese mixture over base and smooth the top and spread evenly. Chill for a minimum of 3 hours, but preferably overnight. When ready to serve, carefully transfer the cheesecake to a serving plate and arrange meringue nests. 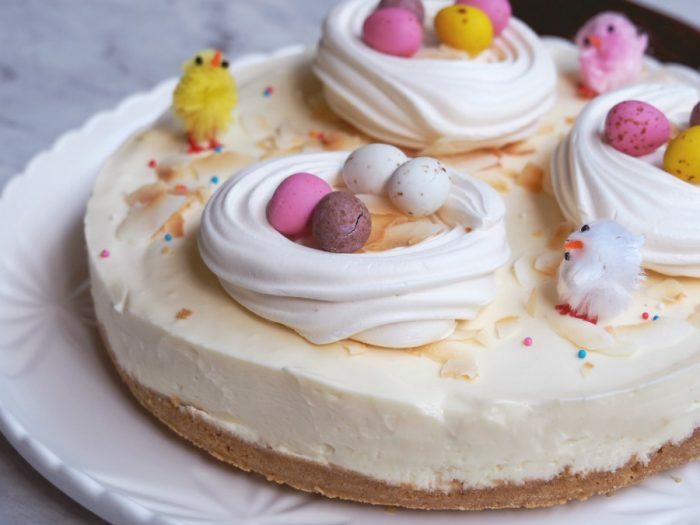 Fill with mini eggs, sprinkle with coconut and hundreds and thousands and decorate with a few chenille chicks. Melt butter for 2-3 minutes at 60C on speed 2. Check butter is completely melted. Add biscuits to TM bowl and crush for 5 seconds on speed 9. The mixture should have the texture of damp sand. If necessary, blitz for another 5 seconds. Tip the mixture into the springform tin. Press the biscuit butter mixture into the base of the tin. Use your hands or a spoon to do this. Place in the fridge for at least 10 minutes to chill. Add cream cheese and mix for 30 seconds on reverse speed 5. Scrape down sides of mixing bowl. Add tin of condensed milk and mix again for 30 seconds on reverse speed 4.5. Scrape down sides and base of bowl and repeat if necessary. Add the lemon juice and mix for 30 seconds on reverse speed 5.